The Department of Enforcement and Supervision of the Israeli Ministry of Health conducted a raid on a liquor warehouse in Holon after receiving a tip. The warehouse raided had a trading name of 5-Star Liquor located at 10 Bar Kochba, Holon, Israel. 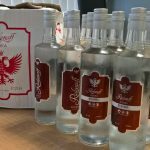 Cases of vodka bottles were seized on the suspicion of forged labels. The tip off to authorities were the absence of production and packaging codes on vodka bottles that bore the brand names, Uncle Smith, Moskva and Louis XV. The fake labels also included the logo of Badatz Eida Chareidis, a kosher certification label for food and beverages. Laboratory tests of the seized vodka revealed that the alcohol content was twenty times higher that than noted proof. The alcohol contained in the bottles tested positive as methanol. Under the supervision of the Ministry of Health the seized counterfeit alcohol was destroyed. Alcohol for human consumption, a product of distillation, is ethanol. Methanol is used by counterfeit alcohol criminals as a quick, profitable substitute when producing fake vodka and other types of liquor by avoiding the distillation process. The methanol these counterfeit liquor producers use is usually intended for industrial use. It is not meant for human consumption. On announcing the high concentration of methanol unveiled in the seized products, the Israeli Ministry of Health reiterated the dangers of methanol consumption. Consuming methanol is considered a poisoning. Methanol acts on the nervous system, destroys vital organs, can cause blindness and death. Responding to fake alcohol concerns that have caused blindness and death throughout Israel, the Israeli Ministry of Health that they will continued a concerted effort with other enforcement agencies to root out and prevent the rise in fake alcohol production and distribution throughout the Nation. As there seems to be more reports of counterfeit alcohol in Israel, buyers should carefully examine the labels, and use the SafeProof.org tips on How to Check for Dodgy Booze. When in doubt, do not consume suspicious alcohol, your health and life are at risk.